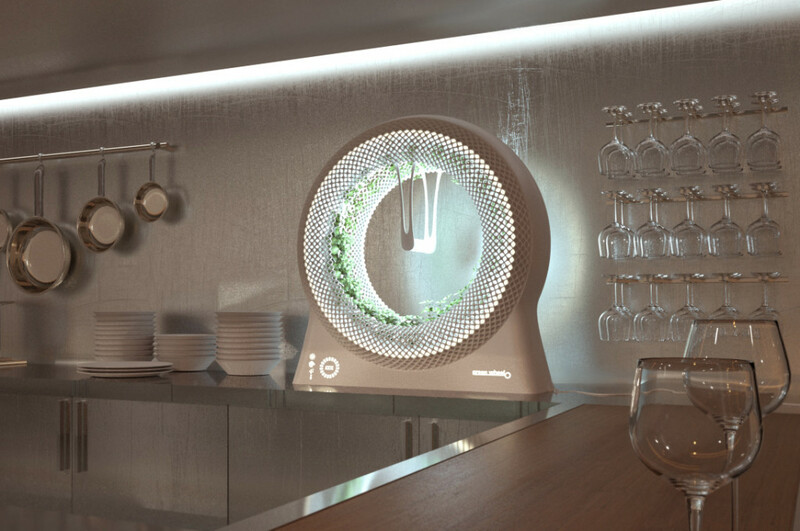 Developed by NASA this revolutionary rotary hydroponic system concept was created to provide a constant supply of fresh herbs and salad in spacecraft. Thanks to its effectiveness and advantages this concept was transferred with success into a daily life. In spite of all these, the rotary gardens had not undergone evolutionary change from aesthetic point of view.The Green Wheel by Libero Rutilo has many benefits over the traditional garden. First of all it allows you to produce a variety of agricultural products. This device is absolutely ecofriendly. It helps you to grow your own fresh herbs and vegetables without leaving home and on the contrary with supermarket vegetables it helps to reduce transportation and plastic packaging consumption. The second benefit is larger growing area that helps to cultivate more plants. Maximized illumination is another advantage of the project. 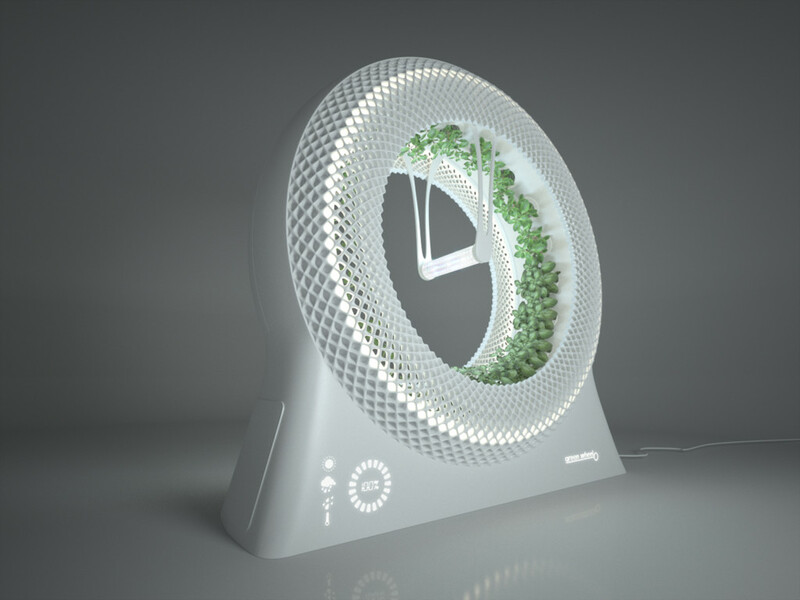 The plants arranged around the light source in the center of the wheel. The lamp is placed closer to the plants. It helps to reduce lighting consumption in contrast with traditional garden lighting. The object composed of outer solid surface case that hides an engine which rotates the plants, a water reservoir and a pump for automatic plant irrigation. 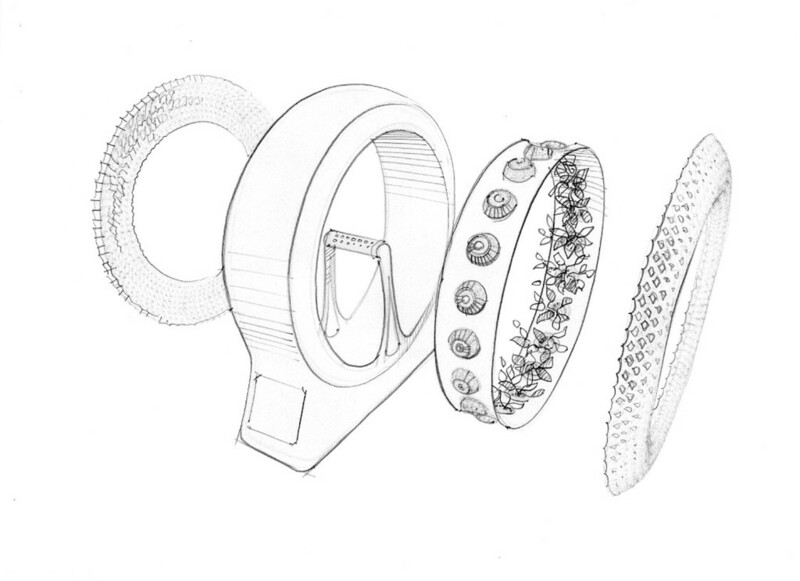 Vases and cover vases are placed in the perforated inner wheel. Each vase contains coco fiber, which provides perfect support for the plant and its roots. Simple and intuitive control interface can be managed through the smartphone or tablet by using an easy application. This application admits to control the amount of illumination, temperature of the light and to be advised of water level.